Winter fitness – what are you waiting for? Courtesy photoWinter fitness for all is offered at Auburn Ski Club. Here, the Sonics race team gives an enthusiastic "poles up." TAHOE/TRUCKEE, Calif. – We all know we should be getting lots of exercise. All the time. All year long. And with the snow flying we start thinking, “Hmmm … I suppose I’ll be doing more time in the gym.” But that kind of sounds like a prison sentence, doesn’t it? Or perhaps you’ll say, “I guess I can put off that new exercise routine until next spring.” Not so! 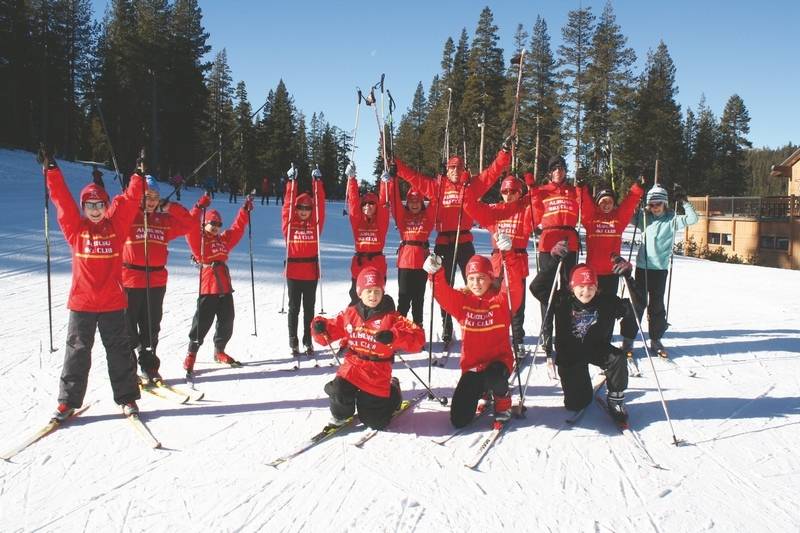 As many have discovered in our abundant outdoor winter-wonderland in the greater Tahoe-Truckee area, we have an easy, fun and rewarding chance for great fitness at any age, ability or interest – cross-country skiing. Some say, “free the heels” while others say “I don’t need to be pulled up the hill.” Whichever way you see it, the cardio and all-around fitness rewards to be had from Nordic skiing are endless. Public access trails in the greater-Tahoe area abound and private Nordic ski areas are numerous as well. While there are many from which to choose, the facilities and opportunities at the Auburn Ski Club (ASC) have endeavored to supply all the necessary ingredients for that non-stop fun-factor while getting fit. There are options for the family at ASC, since the low-cost choices for cross-country trail skiing, various ski programs and Club membership are still the best deal in town. As a local historical fixture, ASC has provided ski opportunities for outdoor enthusiasts for more than 80 years. With roots back in the day of early ski racing and ski jumping in the 1930s, ASC has been a fundamental player in the rise of the ski industry in the Tahoe area, providing ski opportunities from low-key recreational skiers through Olympic hopefuls and everything in between. The organization is based out of a spacious 8,000-foot clubhouse on Donner Summit at the south end of the Boreal Mountain Ski Resort parking area. Currently the facility serves members of the Auburn Ski Club through access to its 20 kilometers of expertly groomed cross-country trails Wednesday through Sunday, 8:30 a.m. to 4:30 p.m. daily with extended dates on holidays. A combined season trail pass/membership rate costs $100 per person (one must be a member to use the facilities). Members have access to the clubhouse, facilities and trails any day the Club is open. Another benefit, on the summit snow conditions allow a longer season than many other local ski areas. Day passes are available at the Auburn Ski Club for $18 per day if you just want to come up and check it out. If you decide to join, apply your day fee to a season’s pass and membership cost that day only. It just about pays for itself with only five days of skiing. Low-cost family friendly cross-country programs are operated December through March with a series of Saturday morning programs. Season rentals can be included for adults and kids. For those looking to improve their cross-country skills, inexpensive clinics for all levels beginning through advanced (both skate and classic techniques) are also offered periodically throughout the season. A fun, but serious, Masters ski program is also available on Thursday and Saturday for the older skier looking for a group experience with coaching. Top-level coaches are provided for all teams whether family weekend programs or for competitive skiers who may ski locally, nationally and around the world. For the more advanced skier looking for racing events – adults and youths alike – there are a dozen cross-country events throughout the season sponsored by ASC and open to all. Weekends buzz with activity for youth programs for all types and ages (all ski disciplines are offered at ASC including snowboard, alpine, freeride and freestyle as well as Nordic skate, classic and biathlon programs for cross-country skiing). The “Club” becomes a haven for young and old alike with a tremendous sense of community and belonging, where everyone comes in feeling welcome and most stay involved for years! So then, only one question remains – what are you waiting for? Get out there and get winter fit. A new healthy winter you is waiting just around the next snowy corner. For information on membership and programs visit http://www.auburnskiclub.org or call 530-426-3313, ext. 110.